We had our friends Kelly and Evelyn over for a pool party when she made her great escape. The girls were running up and down the backyard giggling and playing with the water. Both of us parents were watching them run back and forth, back and forth. And then, well, Evelyn came back but not Ellie. Ellie? ELLIE!? 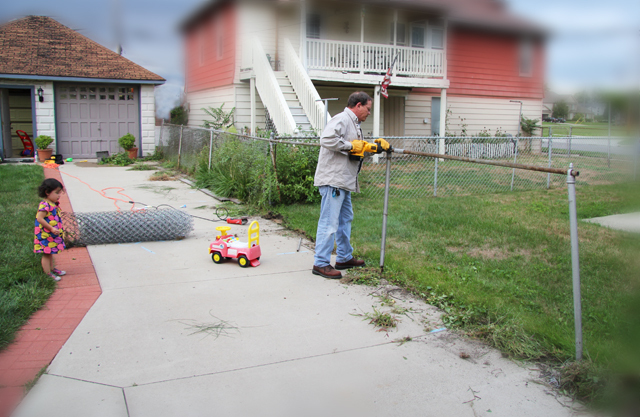 It was time to finally replace that old rusted out fence and definitely build a gate. Not that a gate let’s me be a lazy parent and not keep an eye on her, but hopefully it’ll make a Great Escape less likely for Ellie. Plus, my dad and I were due for a little “father son project” again. 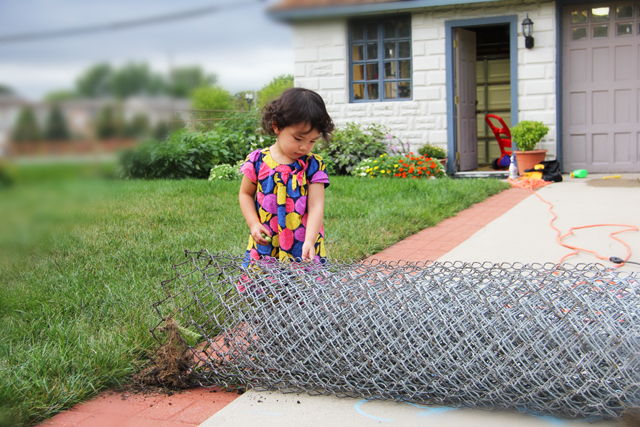 Actually, building a fence together was my Father’s Day gift to him. “To you Dad, my gift is the gift of father son bonding time. And what better way to bond than by building a boundary to celebrate a relationship that has no boundaries!” We celebrated my brother’s birthday on the same day, and well, he got the same thing too. 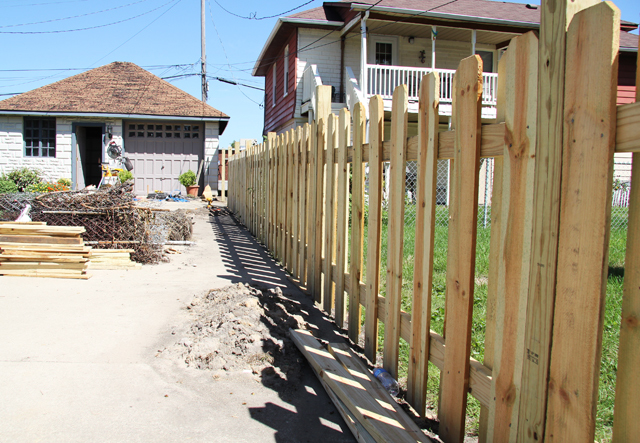 So with my team in place, it was time to tear down the old fence and build a new wood one. But my team wouldn’t be complete without a supervisor. None other than the boss of all bosses, Ellie! 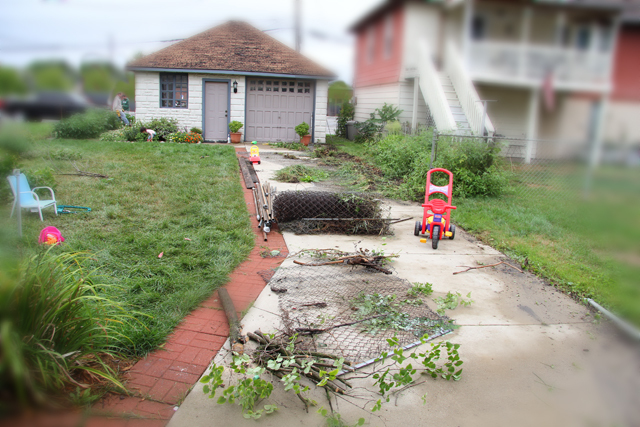 We cut, we dug, we trimmed, we nailed, we screwed, and soon to be stained. We have gates that swing, latch, and lock now. It took a few long weekends, but we managed. Of course, only because of our highly skilled supervisor. We really lucked out with the weather too, because by the time we actually got around to building this thing, the worst of the hot summer weather was past us. And with this cozy new look for the backyard, I’m not so sure Ellie is going to even want to escape anymore. 🙂 gifts are awesome. (for some reason your bachelor party comes to mind!!) lol. 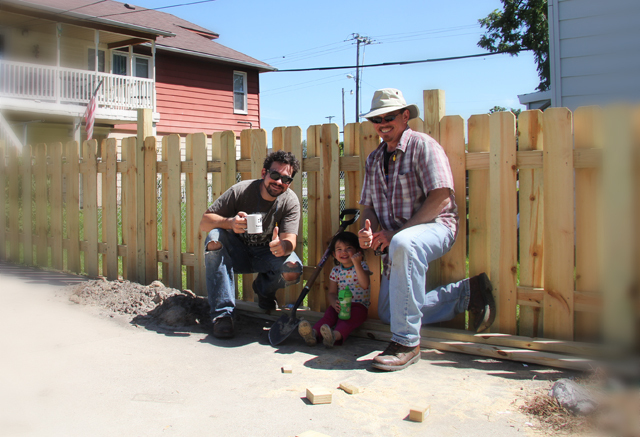 the fence, your dad, and the little helper look great!! !